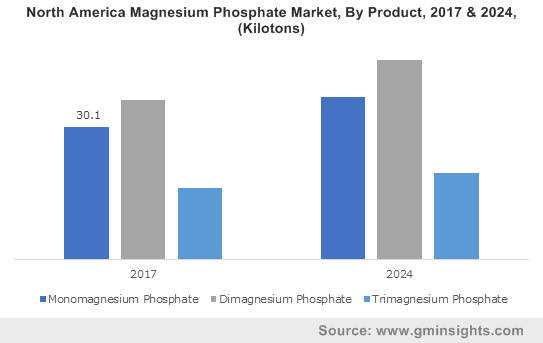 Predominantly driven by an extensive application domain including pharmaceutical, food and beverages, and fertilizers, the magnesium phosphate market has garnered commendable proceeds over the last few years. The ever-increasing utilization of magnesium phosphate in water treatment applications and fertilizers is a pivotal factor to have boosted the pace of product penetration across various geographies. Moreover, the technological advancements in the pharmaceutical sector to incorporate the mineral in various medicines has proved to be quite lucrative to the overall magnesium phosphate industry. The consequences of nutritional deficiency have been well-documented by healthcare institutions and research organizations in the past. Particularly, magnesium is regarded as one of the most vital ingredient in the overall nutrition-rich diet – a factor that has led to increase in research and development activities focused on finding applications of magnesium phosphate in the nutritional supplements sector. Consequentially, this has contributed toward the rapid progression of magnesium phosphate market share in the last few years. In this regard, it would be prudent to mention that the mineral is being increasingly utilized by nutraceutical and specialty ingredient solution providers to manufacture nutritionally-rich products. Moreover, the major nutraceutical companies across developed nations have been acquiring upcoming firms to boost their overall health and nutrition product portfolio. The U.S.-based Innophos Holdings, for instance, has recently acquired proprietary nutraceutical ingredients maker NutraGenesis to complement its range of products and offer more differentiated ingredient solutions to its customers. Owing to the rising geriatric populace and increasing prevalence of orthopedic ailments, the magnesium phosphate industry has been garnering massive popularity across the biomedical and healthcare sector in the recent times. Especially, the escalating demand for magnesium phosphate from the dental care and orthopedics segment has been a major factor to propel the pace of product penetration. For instance, the National Health Interview Survey published by the Center for Disease Control and Prevention (CDC) had found that around 22.7 percent residents (aged 18 years or older) in the United States had doctor-diagnosed arthritis. Elaborating further, the National Health Interview Survey, which was conducted between 2013 and 2015, further noted that the prevalence of arthritis and osteoarthritis is expected to increase in the coming decades. Considering these statistics and the growing risk of orthopedic ailments, the demand for magnesium phosphate from biomedical applications is likely to witness a drastic uptick in the North America, which accounted for more than 15% of the global magnesium phosphate market share in 2017. In fact, the North America magnesium phosphate market is projected to register a substantial CAGR over 2018-2024, driven by the robustly expanding pharma sector. Even though the highly-diverse and an all-inclusive end-use landscape is certain to significantly boost the revenue prospects of magnesium phosphate market, it would be prudent to take note of some imminent challenges that may hinder the product penetration in the future. Insufficiency of raw material across prominent manufacturing terrains is one of the major factors that may influence the price trend of magnesium phosphate. In addition to the aforementioned factor, the uneven geographical spread and distribution of phosphoric rock reserves is likely to adversely impact the production rates of several manufacturing units. Moreover, the rapid pace of development and commercialization of substitutes, owing to advancement in material science, would bring about a drastic change in the way magnesium phosphate is being utilized. Rapid economic growth being witnessed across emerging countries such as India and China would favorably impact the revenue portfolio of magnesium phosphate market in the years ahead. The increasing demand of magnesium phosphate from several end-user segments along the likes of food and beverages, pharmaceutical, and healthcare would push the magnesium phosphate market trends. According to a comprehensive research study undertaken by Global Market Insights, Inc., the remuneration scale of magnesium industry is projected to surpass USD 1.5 billion by 2024.